Little Miss: There is a huge hallway that looks out onto the courtyard. In the dining room where we had dinner, there were a lot of weird old paintings. Little Miss: There was an old church just off of the courtyard that still gets used sometimes. In the courtyard there was a fountain and lots of beautiful flowers. We saw some bright green emerald hummingbirds sucking the nectar from the flowers. 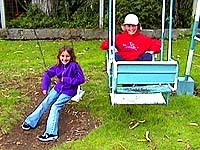 Little Miss: We went out to the back of La Cienega and there were swingsets, a tennis court and a big tractor. 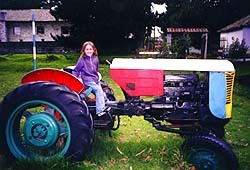 I remember the tractor really well! It had really big tires and I sat in it and drove it (just pretend). 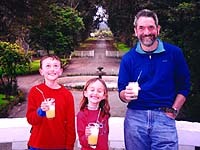 Little Miss: I had a fresh pineapple juice on the very nice big balcony. It was a wonderful place. 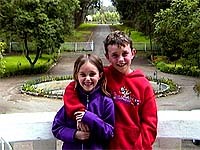 I want to go back again! 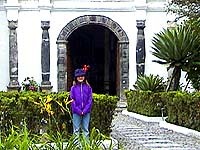 Hosteria La Cienega is one of Ecuador's oldest colonial haciendas. Situated near the slopes of majestic Cotopaxi volcano and its National Park, this mansion has been the scene of important events in the scientific and social history of the country. Among the important celebrities that have resided at La Cienega are Charles Marie de la Condamine, a French scientist who participated in the Geodesic Mission (1736-44) that determined the true shape of the earth and laid the path towards the development of a universal system of measure - the meter; and Alexander Von Humbolt, German naturalist who studied Cotopaxi's volcanic activity (1802) as well as its unique alpine flora. 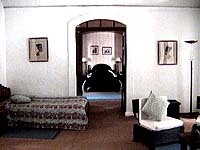 Today, tastefully converted into a first-class hotel, La Cienega offers the visitor the unique experience of staying within its two-meter thick volcanic stone walls which stand as silent witnesses to the history of a people and the poetry of an era. You will be surrounded by the breath-taking natural beauty of the landscape and the rich folklore of Ecuador's indigenous people.